We always spend Memorial Day with the Schwartz's. This year we had our annual gathering at the Schwartz Shack, lake house, Schwartz place...whatever you want to call it. I was a little iffy on this gathering location cause I forgot they had the air conditioning installed recently and I didn't think Charlie would be allowed on the boat. So I thought I'd get left behind in a hot house while everyone else went cruising on the lake. I was pleasantly surprised that neither of those things were the case. The Schwartz's are coming right along on the house. The air conditioning was a definite plus. The kitchen and living room are dry walled. The new deck is completely up and all they need now are the railings. It's pretty exciting to see what all Dennis and Vickie have accomplished. 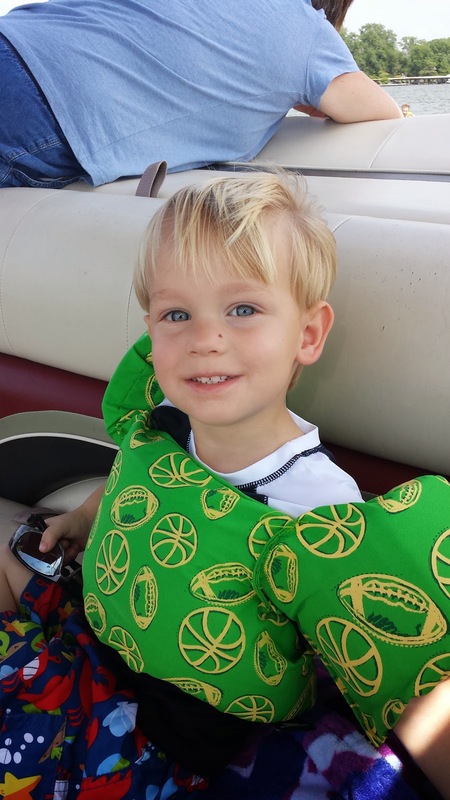 And they even had an infant life jacket from when Holt was a baby, so Charlie was allowed out on the boat. Very exciting! 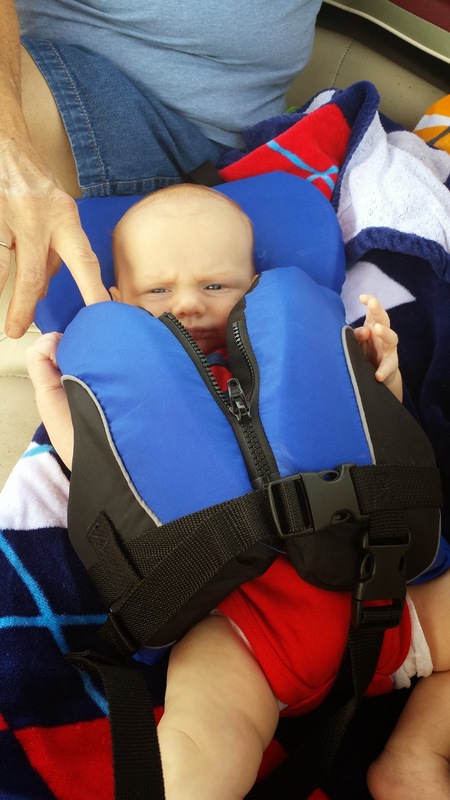 When they got the infant life jacket out I just laughed I figured Charlie was going to scream and hate it. But in true Charlie form, he didn't complain at all. 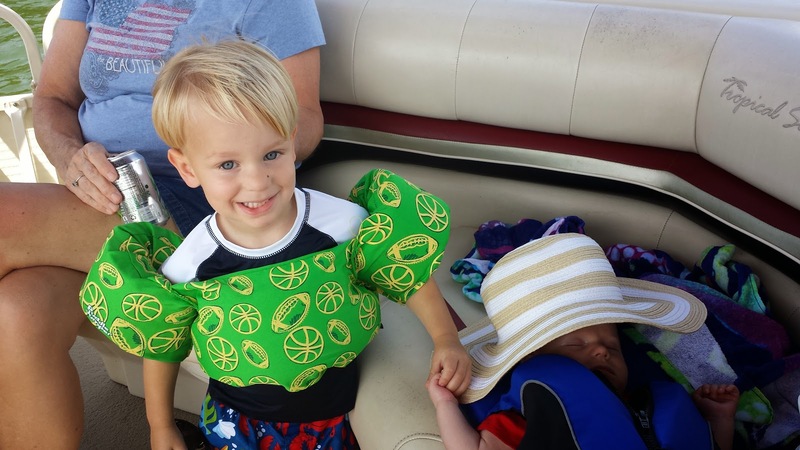 He just chilled out in his giant life jacket. We unzipped it a little when we laid him down, otherwise the zipper was up his nose and his mouth was covered. Cody's been on the boat a few times before. We don't go as often as we should, maybe twice a summer. But Cody's never had a problem. However, this time he just looked terrified. 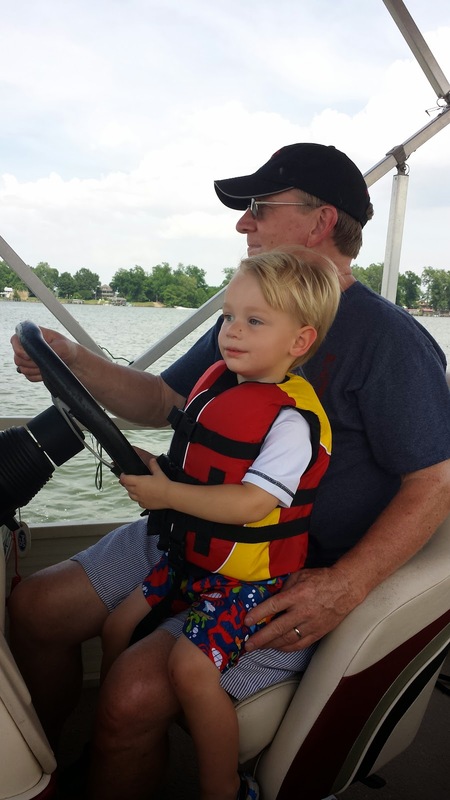 He likes driving the boat with Grandpa the most. Sarah is our little water baby. She LOVES the water and couldn't wait to hop in the lake and swim. Cody said he wanted to get in after he saw how much fun Sarah was having. I knew he really didn't want to get in but we lowered him down. As soon as he was in he started screaming to get out. And then Cody spent the rest of the time empahtically telling you he did NOT want to swim. "Cody do you want to get out and swim?" He'd say, "Nope!" 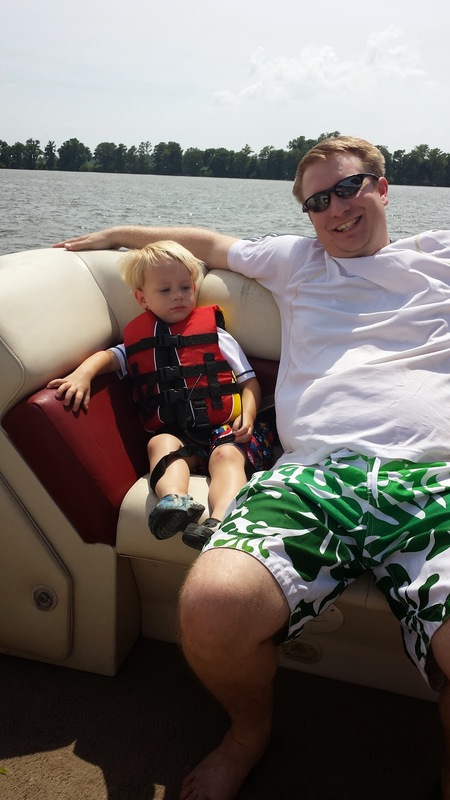 And was quite content to just hang out on the boat with us. Sarah on the other hand would have stayed in the lake all day if she could. Chris said she swims with her mouth open making happy noises, like a dolphin. Cody just wanted to chill on the boat. 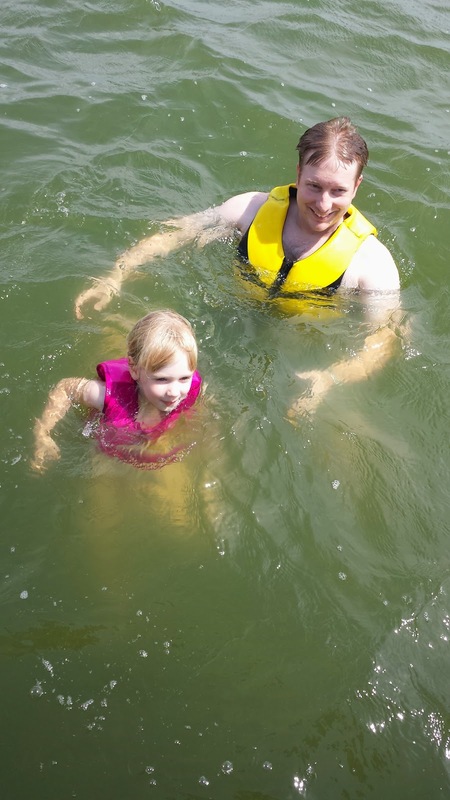 Of course Sarah "swimming" in the lake has more do to with her hanging on Chris. 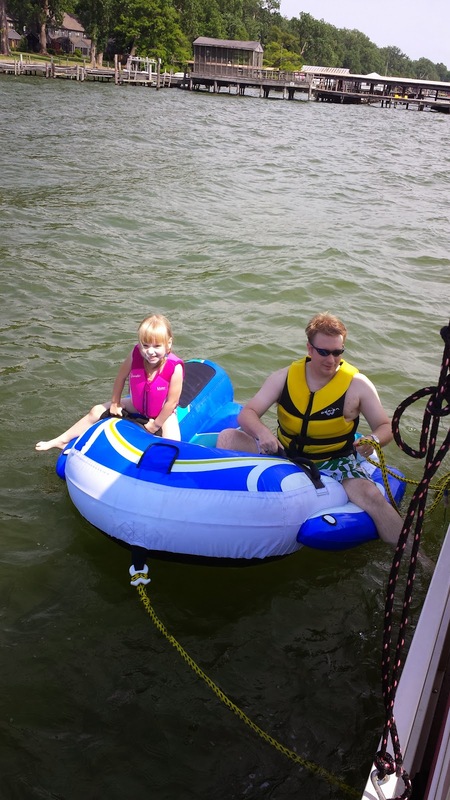 And her life jacket wasn't off balancing the weight she was pushing on Chris. So we headed back to the house to get a few lake toys to make Chris's life easier. Riding on the "rocket ship"
We pulled Sarah and Chris around on the raft for a while. 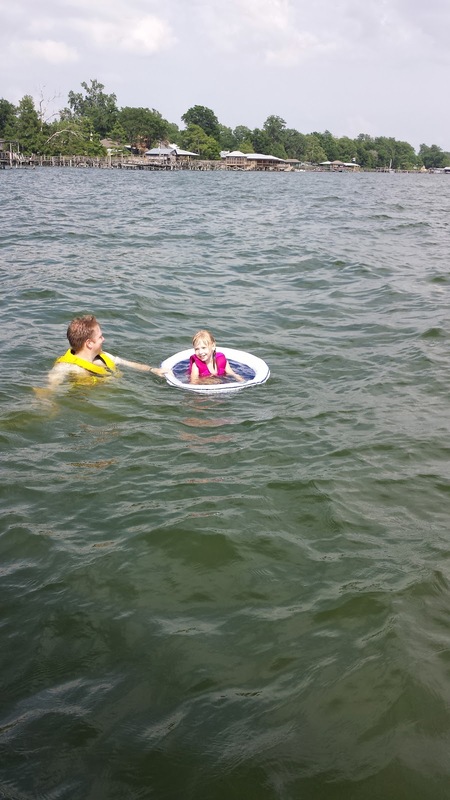 "Cody do you want to ride on the raft with daddy?" Cody says, "Nope!" Charlie just hung out while we rode around on the boat. 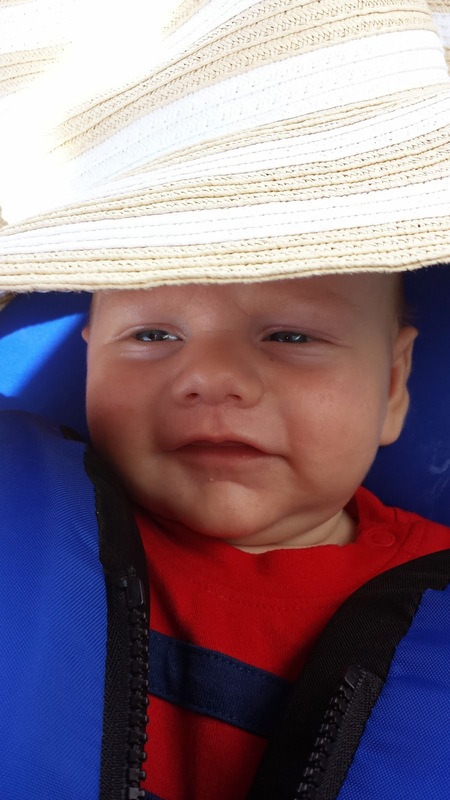 And yes, he's wearing my hat to block the sun. When we went back to the house we switched Cody's life jacket for a puddle jumper. 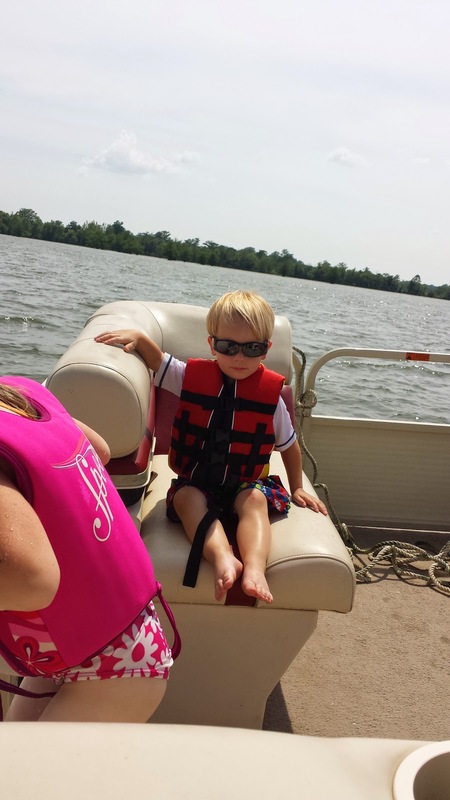 He likes those a lot more and seemed much happier for this part of the boat ride. Swimming at Dennis and Vickie's favorite swimming spot. Cody said he needed to hold Charlie's hand so he wouldn't fall off the boat. Eventually we headed back to the lake house to fire up the grill again. 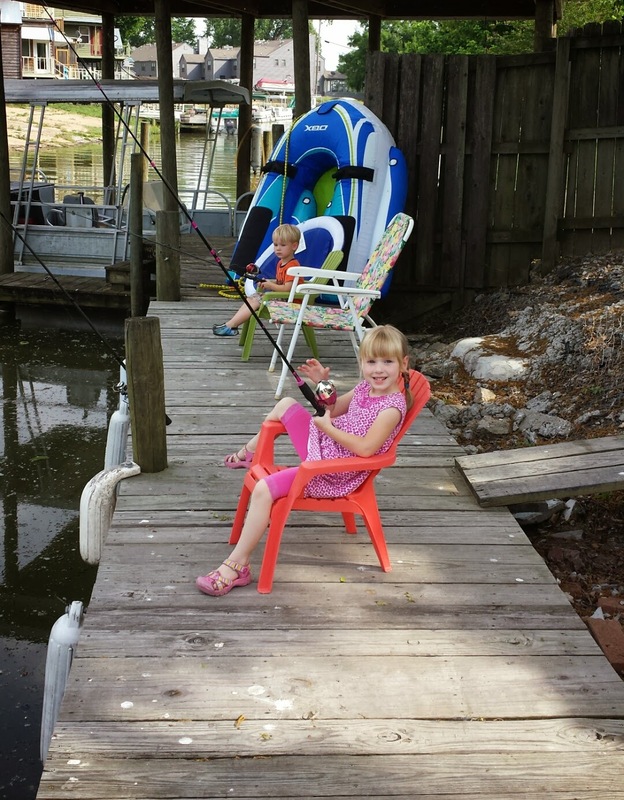 The kids have been obsessed with the idea of fishing. Sarah begs to go fishing all the time. 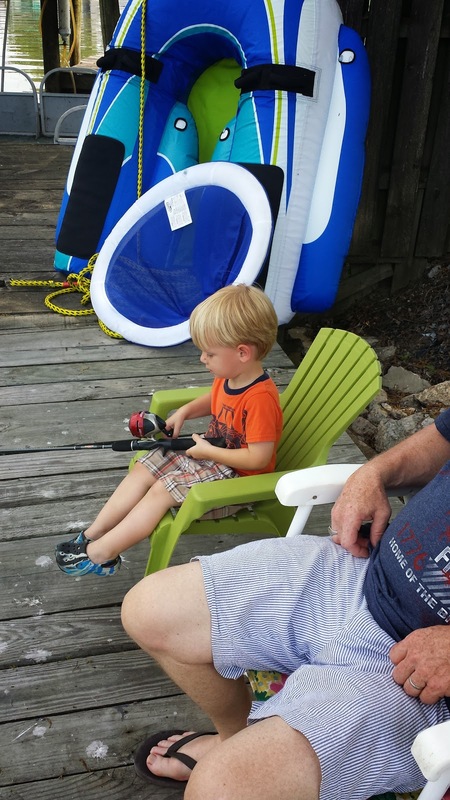 So grandpa got out the fishing poles and set the kids up. I'm not sure how long they stuck with it. But when I came back out Cody's line had caught a fish. He was completely grossed out by it. 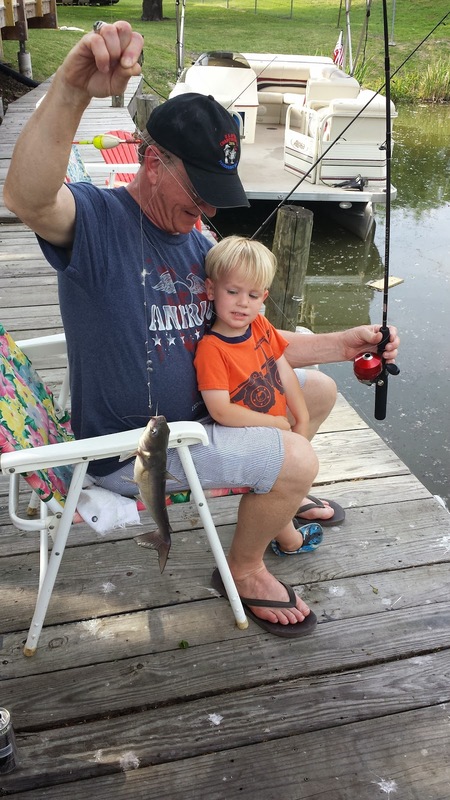 But kept talking about how he caught a big fish all the way home. Love it! 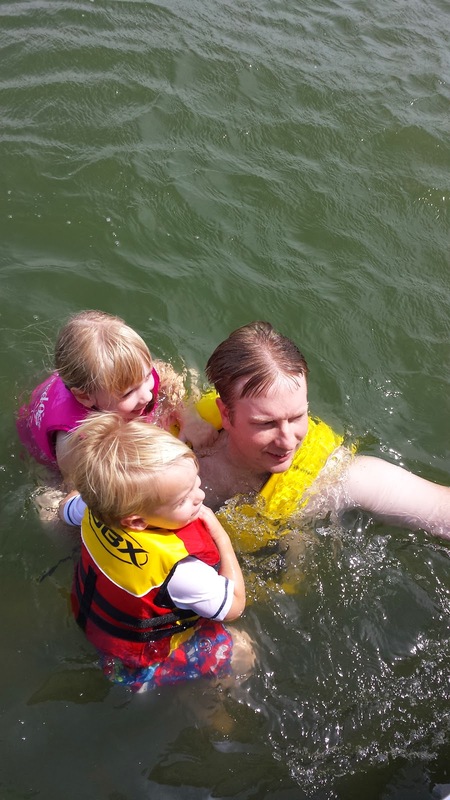 And, looks like yall pretty much had the lake to yourselves; sweet! 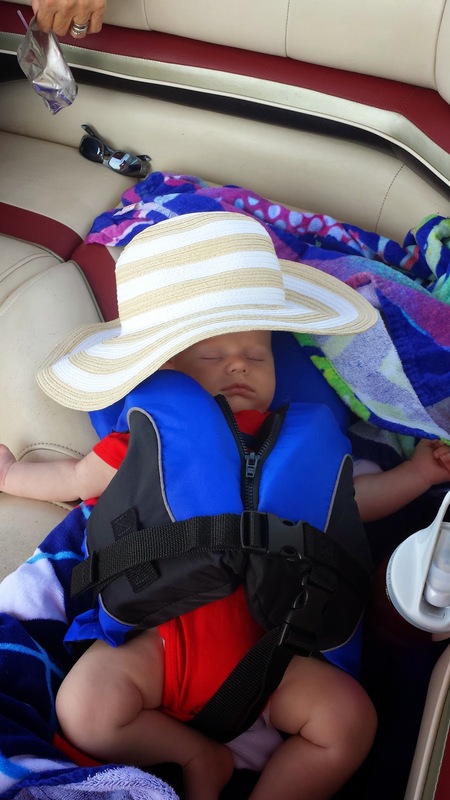 Thank goodness for air conditioning and baby life jackets!